Your kitchen can be your best friend, save you money, and make cooking fun. 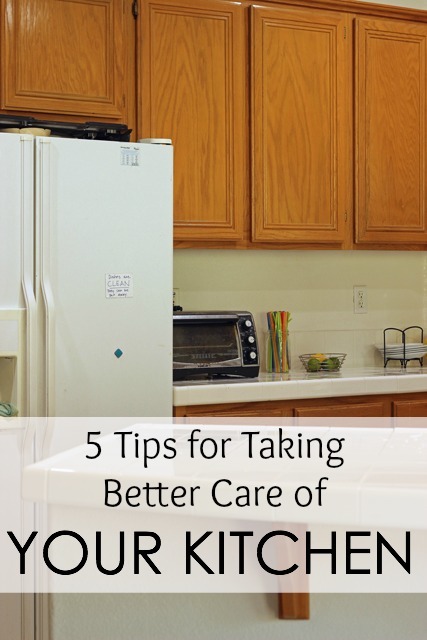 Here are five ways you can take better care of it so it can serve you well. Ours is a busy home. There is always some activity going on, particularly in the kitchen. All six kids can prep meals to some extent. With 8 cooks in the kitchen, you can imagine the messes! I’ve not yet perfected the always-clean-kitchen. But, I’m working on it! Here are some of the things that I find help me keep my kitchen looking it’s best. If everything in your kitchen (ingredients, utensils, appliances) has a special place where it can go when it’s not in use, it will be easier to find things when you want them and easier to put away. You won’t be hunting or wasting mental energy searching. Dejunk your stuff and organize the cupboards so that you can always find what you need. 2. Take out the papers and the trash. I’ve found that trash and paper clutter are a big portion of the clutter at our house. When those have a system for disposal, things look so much better. Make a habit to empty the trash can on a daily basis and spray it with disinfectant to keep it clean. 3. Wash as you go. This can be an annoying tip, but it really does work: Wash as you go. This weekend I spent extended time in the kitchen. I washed dishes instead of putting them in the sink. Cleanup afterward was a breeze. My husband made pizza dough for us a few Fridays ago. He made it with all whole wheat (healthy, but not exactly our favorite) because I had put the regular flour in the bin marked pastry flour. He knew pastry flour wouldn’t work so he used whole wheat. That was my fault, not his. After all these years, he still can’t read my mind! 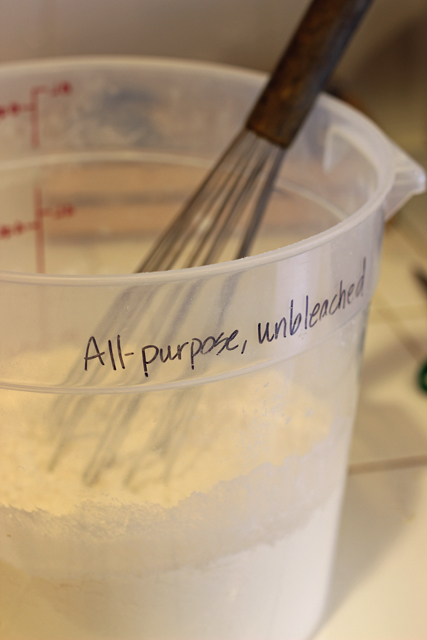 If you label things, especially with the name of the product and the date you bought it, it will be easier to cook, knowing what’s what and when it needs to be used up. 5. Empty the dishwasher as soon as it’s done. With eight people eating three meals a day — my husband often packs food for work — there’s a lot of activity in our kitchen. Always. And honestly? We probably run the dishwasher two to three times a day. Unfortunately, there is often a backlog of dishes. One of the things I’m learning is that if the dishwasher is empty or at least dirty with room to fill, we have a fighting chance at getting the kitchen clean. My new rule that I inflicted on my family this week is that if you’re the first one up, you need to unload. They asked that it be amended to the first one to dirty a dish in the kitchen has to either wash that dish by hand or unload the dishwasher. Unloading is a regular kid chore, but I’m finding that we HAVE TO start the day with an empty washer. We’ll start the day in defeat if we don’t. What are your tips for taking better care of your kitchen? Like you, we eat every meal at home (or packed from home) and dishes are a constant chore. No one in the house likes to empty the dishwasher but if we keep it emptied, life goes so much better. Most nights I try to get all the dishes in the dishwasher and washing while we sleep. I hate waking up in the morning to dirty dishes! I am also a big believer in preparing in advance as much as possible. We pack lunches the night before, get breakfast items, snacks and water bottles ready for the morning and put the coffee on a timer all before we go to bed. Time is at a premium in the mornings so doing what we can the night before really helps. Help. Where can I store that giant kitchen aid mixer? It’s on the counter. It doesn’t fit in any of the kitchen cabinet we have. We don’t have a proper pantry. I we have a front closet that I snuck a shelving unit in. Top shelf on that until has an electric griddle. I’m bracing myself to return to my 20+ year old Sunbeam mixer, just so I can remove the heads and get it off my counter. Any ideas for storing that thing? Great question. We have a built in desk that we don’t use as a desk because our large dining table is right there. I store mine on that. It’s out of the way and doesn’t clutter the regular-use counter tops. Mine is on the kitchen counter in the corner, always plugged in, because I use it pretty often. If you aren’t using it much, you might want to just sell it. If you can’t bring yourself to do that, what about under a bathroom sink (like in a guest bathroom?) or in the laundry room in a cabinet, or in a cabinet in the garage? But really, if you can push it out of the way then don’t worry about how it looks, unless Home Beautiful is coming to take pictures! Thanks for the comments. Fortunately Home Beautiful has no plans to visit – loved that comment! I was able to ‘shoehorn’ a small 16×16 shelving unit into the corner of my kitchen (there’s a chimney chase that it just fits in front of). I left of one shelf when I was assembling it in order to make a shelf high enough to fit my KitchenAide. The wok lives on top and there’s room for my tea pots right at eye level where they make me smile when I walk into to kitchen. Countspace is too valuable to be taken up by small kitchen appliances! I would love a shelf in the kitchen for my cookbooks!